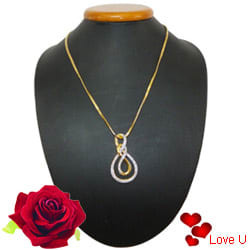 Online delivery of best wishes along with this Fabulous Ayla Double Knot Neck piece with Chain for your dear one. This Gold Plated exclusive product is garnished with American Diamonds. Flowers Delivery Bhilwara, Send sweets Baramati, Wedding Cake Guwahati, Diwali Mithai Kanpur, Send Flowers and Gifts to Khanna, Online Shop Renigunta, Flower to Sonipat, New Year Flowers Pallakad , Fresh Fruits Mhow, Send Gift Khammam, Dry Fruits to Gurgaon, Birthday Delivery Panvel, Sending to Anand, Flower shop Agra, Gopi Online Cake Delivery.